After a brief hiatus, veteran National Geographic photographer Gerd Ludwig revived his yearly workshop, The Art of Storytelling, in 2018. 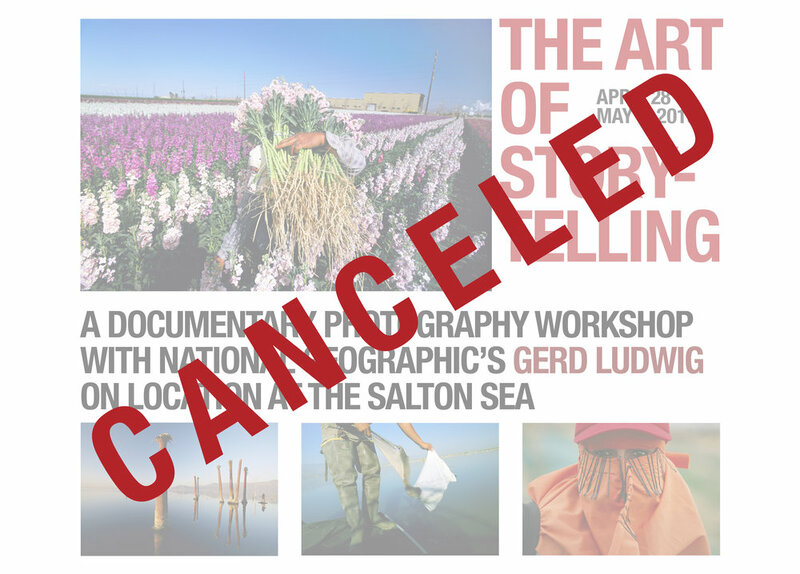 Taking place in Los Angeles and on location at California’s Salton Sea—one of the most ecologically and socioeconomically bereft regions in the United States—the workshop is being offered once again in 2019, from April 28 to May 4. This 6-day workshop, an official part of Month of Photography Los Angeles, is for professional and amateur photographers alike that are committed to taking their craft to the next level. It concentrates on the aesthetic, technical and logistical aspects of photographing with personal vision. Participants will meet at Gerd’s home in Mount Washington, Los Angeles, for 1.5 days of portfolio reviews, instruction and theory, before shooting for 3 days at the Salton Sea. The final 1.5 days are filled with editing and sequencing, with a joint presentation of work concluding the workshop. In the afternoon of day 1 (half day), we will all gather at my home for portfolio reviews. Day 2 is reserved for exploring the techniques of storytelling. I will outline the structural elements and differences between a reportage, series, and essay and share my personal approaches when photographing my stories for National Geographic Magazine - all accompanied by various sample presentations. In the morning of day 3, we will relocate to the Salton Sea, jointly checking into a small inn. The afternoon is reserved for exploring and photographing the area around the Salton Sea. On day 4 and 5 we will be leaving early in the mornings for full days of shooting. As I have spent many months along the Salton Sea for NatGeo and on personal projects, I will lead you to the most interesting locations that offer ample opportunities for amazing photographs. During these days, I will be in the field with you, giving hands-on advice on technical, compositional, and structural levels. The evenings are for downloading, captioning, pre-editing, additional instructions and ‘photo camp talk’. After returning to LA in the late morning of day 6, we will reconvene at my home for a last round of editing, toning, and sequencing the work. The course will culminate the next morning (day 7, half day) with each photographer presenting his/her photographs to the class for feedback. Be prepared for long hours of shooting, editing, critiquing and interacting with one another and with me (but don’t worry, you will have fun too). Gerd will emphasize the process of finding and researching subjects, photographing people in an intimate fashion, making photographs that communicate emotionally as well as editorially, and using aesthetics in a sophisticated manner. Workshop participants will be encouraged to take professional risks to produce top quality work worthy of publications, contest entries or gallery submissions. Technical discussions will focus on how to use photographic tools in real-world scenarios to capture atmosphere and mood, while maintaining a sense of place; approach subjects and establish trust in order to photograph people in an intimate fashion; use form, lighting, and color in a sophisticated manner to communicate emotionally as well as editorially; balance a personal point of view while respecting a subject’s situation; and use focused editing to reveal a story’s essential truth. Gerd will share his own photographic techniques, such as his choice of cameras, lenses, lighting, strobes, and filters. He will explain how capturing quality images at extremely high ISOs has enabled him to tackle stories for National Geographic Magazine that previously were impossible to explore (Moscow Never Sleeps, Chernobyl, Russian Orthodox Church, Sleeping Cars etc). Gerd will address the changing market for photographers, and how to expand short assignments into long-term personal projects using the latest fund-raising, distribution, and marketing methods. As a pioneer in crowdfunding, Gerd successfully financed a trip to the Chernobyl Exclusion Zone via Kickstarter and ran a second successful Kickstarter campaign to publish his award-winning 20-year retrospective book “The Long Shadow of Chernobyl,” which accompanies his interactive multimedia iPad app. Throughout the workshop, critiques will take place, both in groups and individually. In meetings with the students, Gerd will be available for advice on personal photographic aspirations. Students must bring their own photographic equipment, laptops, and storage drives. The basic workshop fee is $1,285 per student. To sign up, please send your deposit of $285 through Paypal to studio@gerdludwig.com. Feel free to contact us if you have any questions. A second payment of $500 is due by March 15th and the final balance of $500 by April 1st. The workshop is limited to 10 students. Students from out of town will need to book their own accommodation for their days in Los Angeles. The rooms at the Salton Sea start around $70 plus tax per night. Participants have the option of sharing rooms to cut the cost. Please contact us if that is an option you are interested in. Transportation to, at, and from the Salton Sea to LA is included in the workshop fee. However, students are free to use their own cars to get to the Salton Sea for increased independence and flexibility. All payments are non-refundable. If a participant cancels, the first two payments will become a credit towards future workshops. The Salton Sea is California’s largest, most troubled lake and an all-American ecosystem gone haywire. 35 miles long and 15 miles wide, it lies 227 feet below sea level with no outlet and very thirsty neighbors. It offers a wide range of opportunities for amazing photographs. Born in Alsfeld, Germany, Gerd Ludwig studied Photography at the Folkwang University of the Arts (Folkwangschule) in Essen, Germany, and graduated in 1974. That year he co-founded VISUM, Germany’s first photographer-owned agency, and began working for publications such as Geo, Stern, Spiegel, Fortune, Time, and Life. In 1984 he re-located to New York, and signed on as a contract photographer for National Geographic Magazine in the early 1990s. His focus on environmental issues and the socio-economic changes following the dissolution of the Soviet Bloc resulted in his book and exhibit, Broken Empire: After the Fall of the USSR, a ten-year retrospective published by National Geographic. His ongoing coverage of post Soviet Russia has garnered his distinction as being the world’s foremost color photographer documenting the region. His ongoing work after the Chernobyl nuclear disaster resulted in the publication of an acclaimed iPad App and the trilingual Long Shadow of Chernobyl photo book, which was named the 2015 POYi Photo Book of the Year. This was followed in 2016 by minus 2/3, a book about flash technique, published in English, German, Italian and Chinese and in 2017 by his monograph Sleeping Cars (Lammerhuber), a personal examination of resting cars in Los Angeles. Now based in Los Angeles, Gerd Ludwig continues his work for National Geographic Magazine, photographs personal projects, lectures at universities, teaches photographic workshops, and exhibits his photographs in galleries and museums around the world. He is the recipient of the 2006 Lucie Award for International Photographer of the Year and the 2014 Dr. Erich-Salomon Award, the highest lifetime achievement award in editorial photography in Germany. In 2015, he was the first German individual to receive the prestigious Missouri Honor Medal for Distinguished Service in Journalism from the Missouri School of Journalism.